This three-act comedy depicts scenes from life in enemy territory, and we get to know pretty much everything which war has to offer in the way of adventure, audacity and surprises, but also just as much that is heartily refreshing and poignant. Going on patrol, taking prisoners, courts martial against ‚German barbarism‘, French chauvinism, happy camp life, and the king’s birthday celebrations, take cheerful turns, with particular emphasis on the comradely co-existence of the officers and commanders, with the men, and the way they stuck loyally together. The allegiance of the men to the officers appears in its purest form. And such a model of the purest Bavarian sort is the batman Hias, who saves his wounded Lieutenant from an ignominious fate at the hands of the French, by his quick decisiveness, his bravery, and his intelligence, and dispenses to the guilty their just deserts. But it is not just about the story in the play, what thrills us so much about this theatre is the fresh wind that blows through it, its originality and authenticity. It is theatre, but then again, not, it is more, in a higher sense, real life, which is even emphasized by the clumsy presentation. What these field greys ‚act‘ for us on the stage of the Munich Volkstheater, is just the repetition of their experience, if in a different form. It is born of their impressions, and is surely only a mirror-image of their innermost nature, as it developed out there in the field. This is most clearly apparent in the second act, in which the birthday of the Kin (king) is celebrated, and the soldiers embellish and lighten up the celebrations with their modest performance, which is acclaimed by their comrades. And while schnadahüpfeln are sung, and a genuine Bavarian schuhplattler is danced, with two soldiers as pretty dearndl, the field telephone is in service on the officers‘ desk. Messages are received and sent, the war machine goes its hard, relentless way. The audience applauded this act like no artistic performance before it. In the intervals, the military band played patriotic songs and marches. It goes without saying that the entire cast, which included a number of society ladies, gave their services free, the entire proceeds from these performances go to the Red Cross, for military charities. And as it in this sense doesn’t really aspire to be theatre in its usual form, the playbill doesn’t give the names of the cast, not even the author of the play emerges from his modest reserve. A film should have been shown during the third act, but the police unfortunately cancelled it because of fire risk, so that we weren’t able to see the deployment of the artillery, hand grenade battles, and hand-to-hand close combat. And finally, at the end, there was a large-scale living picture of ‚War and Peace’, which also drew a great deal of applause. We were told that the Field Greys‘ Theatre, which is giving only eight performances in Munich, intends to tour the whole country. It will certainly be well received everywhere, all the more so because this play contains some intelligent, friendly and optimistic statements, which find a lively echo in the hearts of the audience. And in between times, lots of jokes and wholesome, powerful, traditional Bavarian humour, which was really infectious. It goes without saying that our allies, especially the glorious Austro-Hungarian army, were mentioned. There is no doubt, the ‚Bavarian Hias‘, the genuine ‚Bavarian Lion‘ character, will find the most heartfelt understanding on his tour through the German lands, for his calm, sedate, kind smile, which is so capable of warming the spirit. It’s just that we here, according to our national character, are more aware of the individual, and they there the general. But this is also really nice, in a higher sense, real life. It’s so cosy to sit there while the war machine goes its hard, merciless way on the stage, and to watch soldiers playing at soldiers, and some of them are pretty dearndl, and there are society ladies taking part, and only the hand grenade battle is missing because of the risk of fire, but death presents living pictures. the others were killed in close combat, but we skirted around the close combat, but wholesome humour brings reinforcements, and it is so touching that one can hope to see it through until one comes to eternal peace with oneself, with that calm, sedate, kind smile which warms the spirit. No hand-to-hand combat, today there is schuhplattler! No close combat, schnadahüpfeln! No trouble at all. I’m in charge. „What kind of company is it? Why are they on tour?“ „The best actors in the world, whether for tragedy, comedy, history, pastoral, pastoral-comedy, historico-pastoral, tragi-history, tragi-comical, historo-pastoral, for indivisible plot or continuous poem. Seneca can not be too sad, nor Plautus too amusing, for them. They are unequaled for written texts or improvisation.“ „To hold up a mirror to nature: to show virtue its own features, to show disgrace its own image, and show the century and contemporary bodies the imprint of their form. Oh, there are actors whom I have seen play, and have heard praised by others in the highest tones, who, to say the least, had neither the tone nor comportment of Christians, heathens or human beings, and strutted and bleated so that I thought that some servant of nature had created people who turned out so badly and they imitated people so hideously. And don’t let those who play the fool to you say more than is in their parts, because there are some of them who laugh themselves, just to get a stupid audience to laugh when they should be paying attention to some essential bit of the play.” „The actors can keep nothing secret, they tell it all.” „Have you heard what it is about? Won’t there be trouble? No, no, they are just joking, poisonous fun, no trouble at all. What is the play called? The Mouse Trap. How come? Metaphorically.“ „The King gets up. What? Frightened by a false alarm?“ „Oh, the healthy skip and laugh, it is spoiled for the sore. One sleeps, the other lies awake, that is the way of the world. Shouldn’t this, and plumes of feathers, and a few puffed up roses on my platform shoes, qualify me for a place among the actors, even if my other hopes are dashed?” „Ha, ha! Come, music! Come, the flutes! But if the Kini doesn’t like the play, what then? But maybe he will like it.“ Oh, dear Horatio, I bet thousands on the word of the spirit! The colour of Germany army uniforms. Corresponds in significance to the British Khaki. 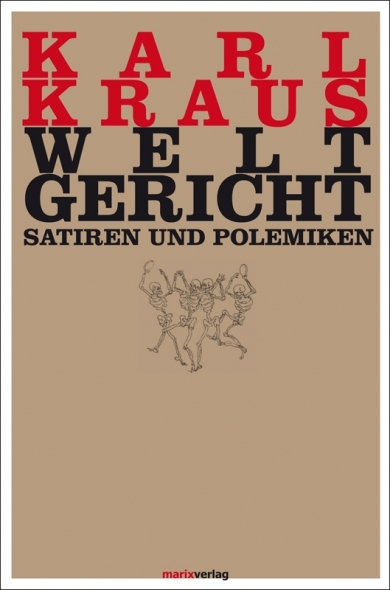 This entry was posted in 1916, Die Fackel, Karl Kraus. Bookmark the permalink.